I thought we'd conclude Friendsgiving week on A Bar Cart in Brooklyn the same way my guests left our celebration: with lots of treats! One thing I love about smaller events is that I can prepare really great favors for guests to bring home. My favorite is to give them something that they can eat for breakfast the next morning - which is a trick I've borrowed from Gramercy Tavern, who sends their diners home with gorgeous, oversized muffins. I call it a trick, because it keeps the guest thinking about your event the next day, in the best way possible. Inside each box is a mini loaf of pumpkin bread (okay, cake). But if you skip the frosting it's not overly sweet and can pass for breakfast. Accompanying each loaf is a jar of caramel cream cheese frosting. I used the same pumpkin spice cake recipe from Bon Appétit that I used to make these tiered newlywed cakes. I told you this recipe is multi-purpose! For the tags, I used this (free!) editable template by Lia Griffith. She intended these as place cards but they worked just as well as gift tags. Lia makes a ton of great party printables - you should definitely check out her site! 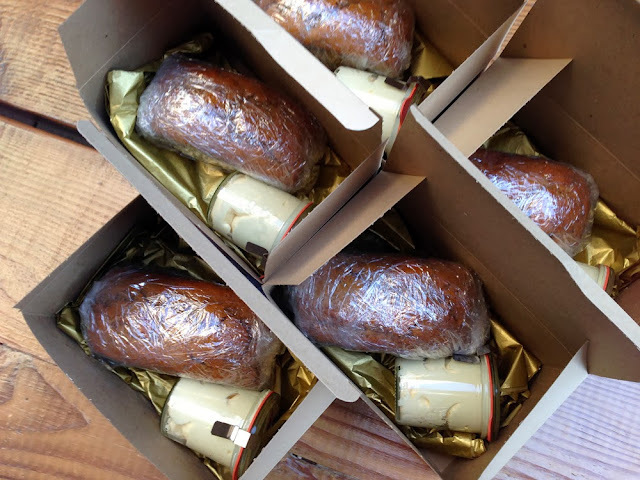 I knew the end of the evening might be a little hectic (okay, fine - I knew we might be a little wine-drunk), so to make distributing leftovers easy I prepared these packages in advance. 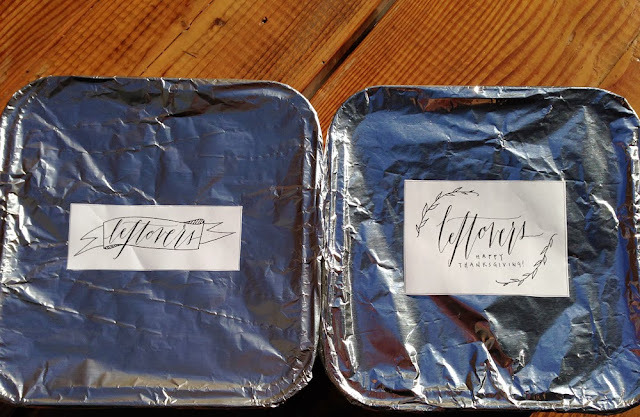 I bought disposable cake tins and covered them with tin foil lids. Each guest took home two tins, one for savory and one for sweet. The savory tin had two small containers inside for cranberry sauce & gravy - I picked up the containers at a local salad bar. The separate sweet tin prevented pie from mixing with stuffing, which would have been tragic. And those beautiful calligraphy labels? They are another freebie I found on Jordan Ferney's blog, Oh Happy Day, designed by calligrapher Julie Manwaring of Flourish & Whim. I printed them on adhesive paper and cut to size. I hope you enjoyed Friendsgiving as much as we did! Is anyone else planning a Friendsgiving this year? I'd love to hear about it!